When I decided to actually create this, I knew I didn't want to break the bank.... Also, I really didn't want to add a bunch of 'stuff' to store for the year. So my goal was to use what I already had for the most part. Let's start with the place settings. 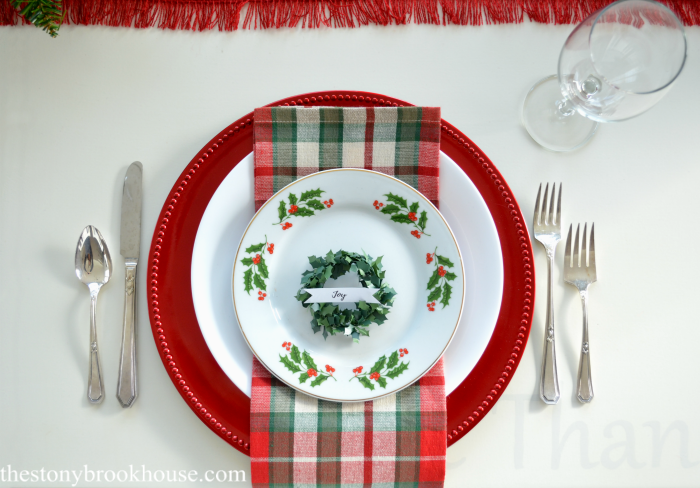 The little salad plates were my inspiration for this tablescape. I was searching all over for something simple and sweet. I just happen to stop in at our local Goodwill and low and behold.... look what I found??? 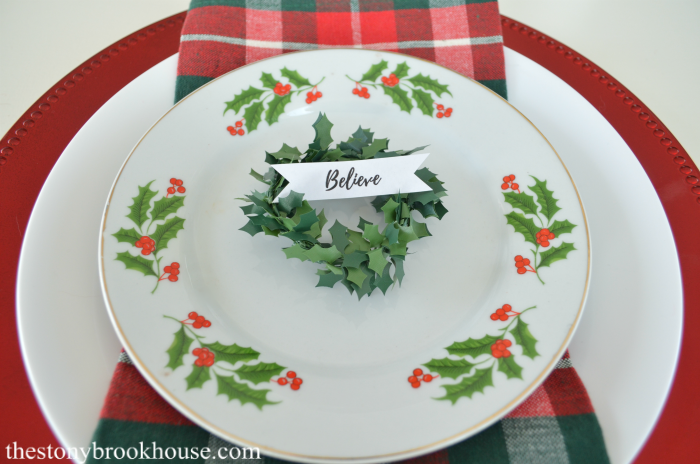 8 matching holly plate for only $4.00! What a STEAL! 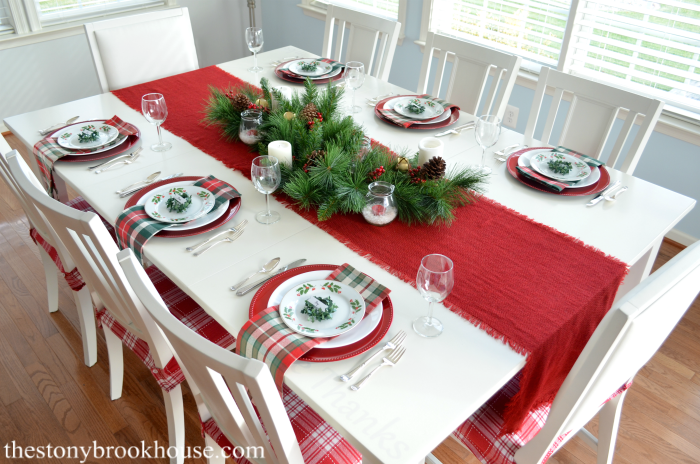 The white dinner plates are our regular dishes we use everyday. I love them! They are the Corelle dishes. 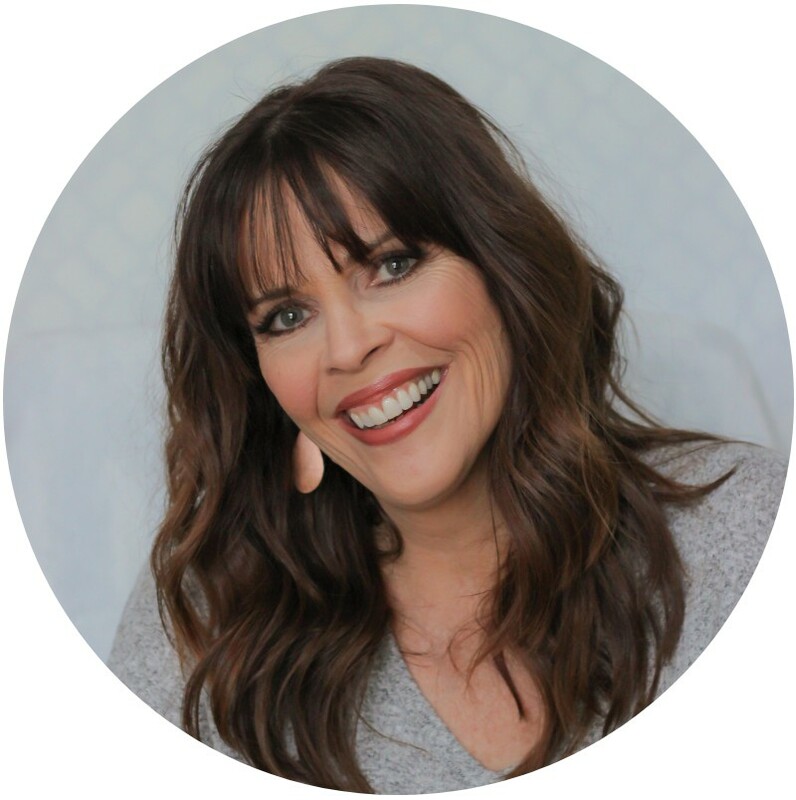 They are lightweight, strong and have held up beautifully! 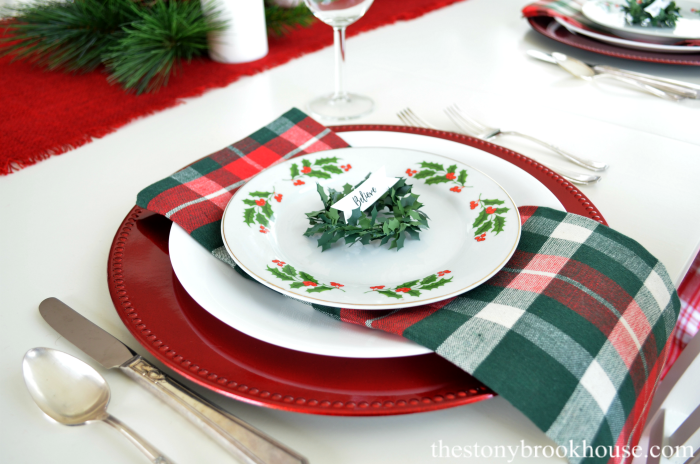 The red charger plates add the needed pop of color! I picked those up at the Dollar Tree. 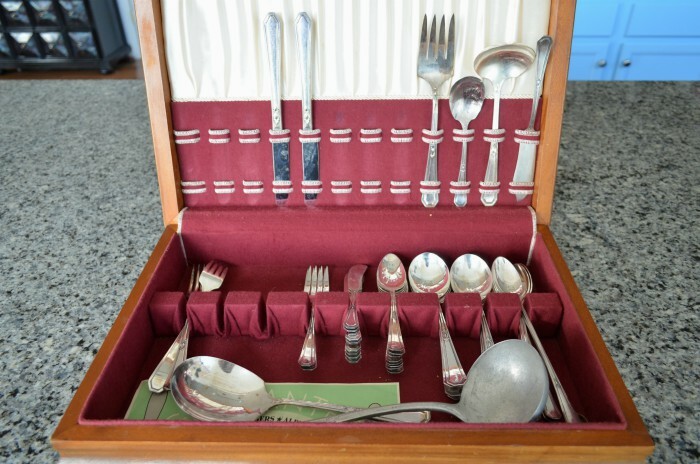 This silverware is antique. It belonged to Hubby's grandparents. I've only used it a handful of times. Don't look too close it needs to be polished, which I will do before our Christmas dinner. The set is stored in this old wooden case. Pretty cool, huh?! 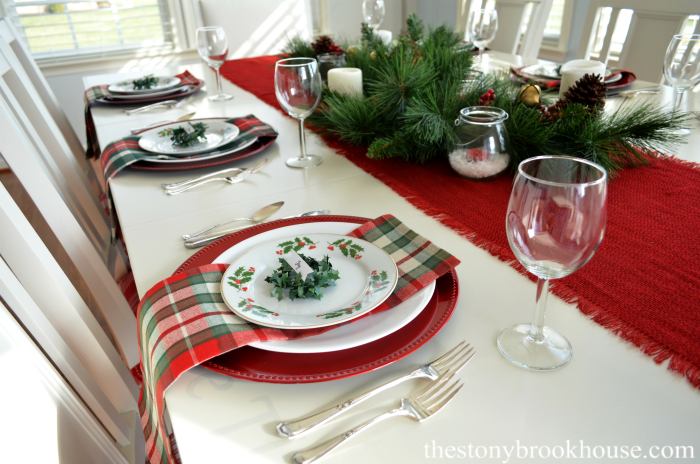 We already had the wine glasses so, I spent less than $20 on the table settings. Not bad! The runner down the center of the table is actually a $5 blanket scarf, I picked up at AC Moore. I cut it apart into 2 sections and pulled threads out to fringe it on both sides. They are just overlapped in the middle. 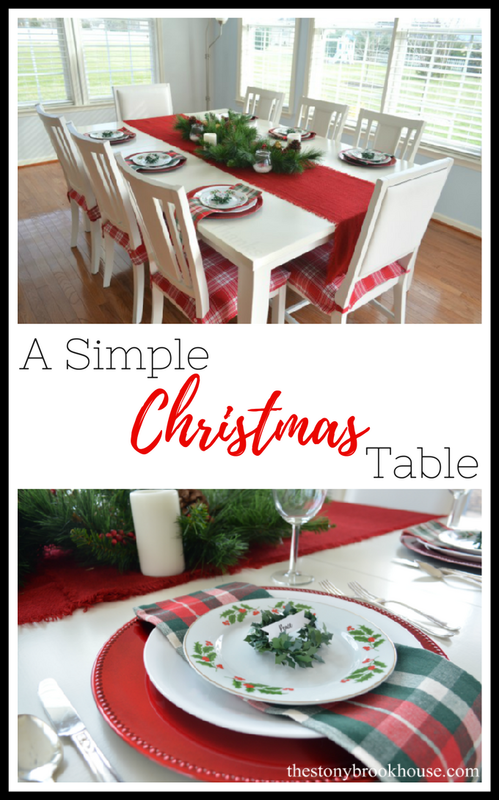 The centerpiece is a combination of the long pine needle garland that I used in almost all of my Christmas decor, you can see that in Our Simple Christmas Home. 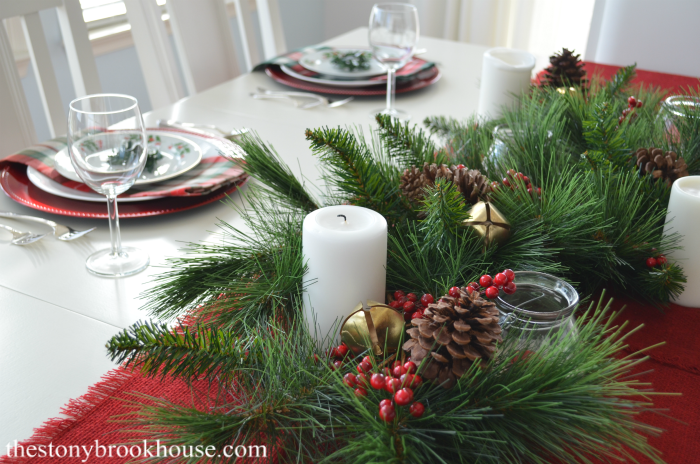 So, it's just weaved along the center with some berry sprigs, pinecones, bells and candles. I found those adorable little glass lanterns at the Dollar Tree. Don't they look sweet with the faux snow and tealight? Well, I'm signing off until after Christmas. Praying you all have a very merry and safe Christmas. Take a moment to thank The Lord for His goodness and mercy for sending His Son, Jesus, the Messiah. Remember the true meaning of why we celebrate Christmas. It isn't about the presents, or the food, or even family.... It's about one special baby that was born to save the world. I love it! Simple is always best. 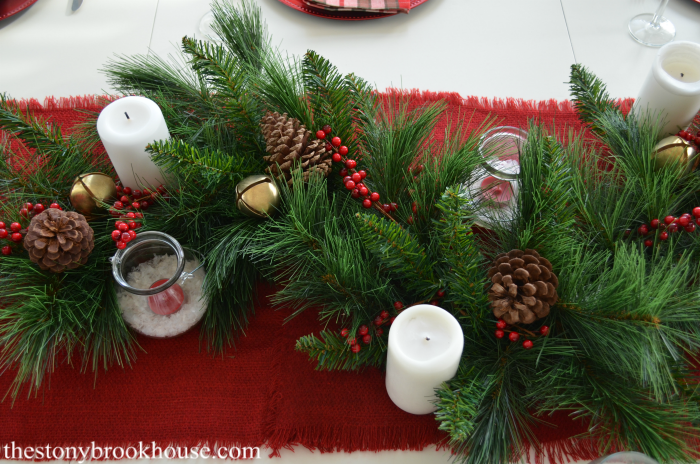 Stealing your idea for faux snow with my candles - I have pillars that have a remote (LOVE IT) and plenty of greenery. 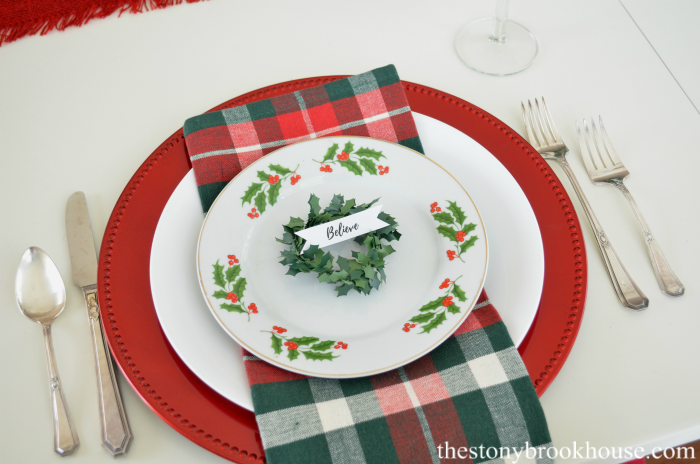 I also love the napkins and chargers - stealing so many ideas from you! Thanks for the inspiration!